Can I Get Credit? Can I Get Credit? Two of the UK’s most iconic car manufacturers have got in the mood for the forthcoming Royal Wedding, by designing unique luxury vehicles for Meghan and Harry. Mini and luxury car customiser Kahn Design have joined the clamour for Royal Wedding memorabilia, but these are no mugs, but two of the most high-spec vehicles on the market. Kahn have customised a Land Rover Defender, complete with the personalised numberplate ‘4 HRH’. The Chelsea Truck Company Flying Huntsman 105 Longnose, to give it its full name is available at a snip of a price of £79,995 and is one of a number of royal-related creations that Kahn have produced. Over the years, they have also customised vehicles for The Queen’s Jubilee, 60th Coronation and also HRH Prince William and Kate Middleton’s wedding day. Kahn’s owner, Afzal Kahn, said: 'As a proud Englishman, this is our way of wishing Prince Harry and Meghan Markle many happy years together. 'The vehicle is currently on display at our Kings Road showroom in Chelsea. 'However, additional vehicles with the 'WED IIN' and 'WED IIIN' registrations will be available at our Kensington showroom. The Mini meanwhile will not be for sale to the general public. The one-of-a-kind Cooper S hatchback is no different to the car which is available from most Mini showrooms, however, it does have a few additional style elements which you won’t find anywhere else. With a Crystal White finish and blue accent stripes, the exterior design is said to be a combination of the Union Jack and the US Stars and Stripes. 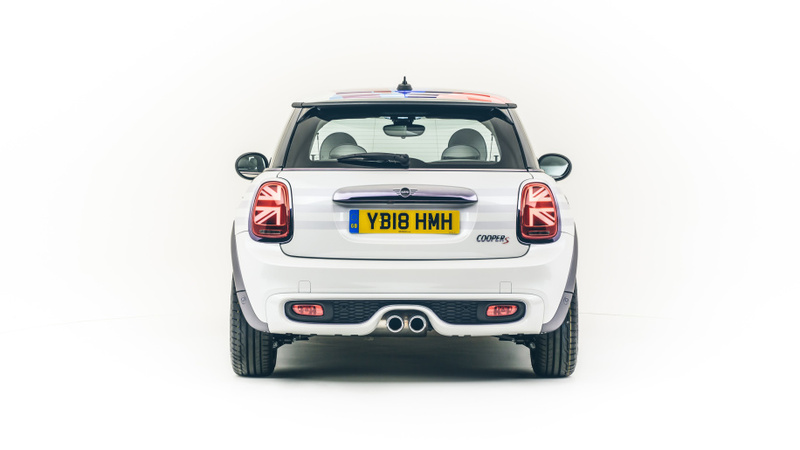 The Royal Mini comes with Union Jack brake lights, which are standard on all Mini hatchbacks, but only the Royal Mini comes with initialled M and H indicator lights. Inside the Mini has a special message added to the dashboard, and plenty of love sentiments on the headrests, sun visors and door sills. One of the most striking features is a ‘Just Married’ light which illuminates the pavement when the door is opened. Speaking about the bespoke car, Mini's head of design, Oliver Heilmer, said: 'As an iconic British brand with almost 60 years of history in the UK, we are pleased to mark the royal wedding with this special charitable gift. The special Royal Mini is being gifted to Children’s HIV Association for public auction, with all proceeds going to charity. Want to purchase your own Mini Cooper S hatchback? Motordepot has a wide range of trims available. Speak to an advisor today. Alternative fuel vehicles include hybrids, bioethanol and liquid petroleum gas. You have to pay an extra £310 a year if you have a car with a ‘list price’ (the published price before any discounts) of more than £40,000. You only have to pay this rate for 5 years (from the second time the vehicle is taxed). Check the list price with your dealer so you know how much vehicle tax you’ll have to pay.